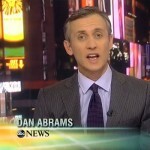 Dan anchored Nightline on Wednesday, March 26th. The episode began looking at a “new age” way to separate called “uncoupling”. Gwyneth Paltrow’s recent split from husband, Chris Martin brought this new way to divorce into the spotlight. Nightline interviews relationship experts to get their take on the newest way to break up peacefully. Next, it’s cops versus bikers when Juju Chang goes behind the scenes of the ‘Chucktown Shutdown’ and finally the feed frenzy looks into the criticism surrounding Russell Crowe’s “Noah”. Watch the full episode here.